What makes it harder to farm? I got a call today from a man that I've done business with for the last 6 years. He asked me if I'd heard anything, any rumors, and I said no, I hadn't, and asked him about what. "Well, the corporate headquarters decided that they are going to close the feed mill on highway 20, and you've been a bulk customer of that mill, and as of June you'll have to do something else for your feed". Apparently they will give a couple of weeks of pay for every year of service, which must be cold comfort for those guys working at the mill who are 55 or older; I see plenty of folks who get this sort of layoff and then take a substantial pay cut on their next job. For the corporation it's pretty easy math; no more health care costs, lower employee salary cost, and more profits for the shareholders. That's all that matters, right? The closing of this mill was a surprise. That mill makes more than 100 tons a day of feed for the local market, which gives it roughly $33k a day in sales, or $600k a month; in the pig farmer area I know of at least 3 pig farmers who are going to have to find another feed source for their complete ration. I've just brought in 500 pigs, and I had plans to bring in another 500 a little later this year. For me this is sort of like saying "hey, the only hardware store in your county is going out of business, so if you need hammers, or nails or whatever, you can drive 10 hours to get them. Sorry about that! I asked about the plans and there was some vague answer about relocating the mill to eastern oregon somewhere, or stockton california (more than 1,000 miles away), and that for bagged feed that they'd be running trucks up here to supply the 100 tons of bagged feed that they were currently selling, but there wasn't a solution for bulk feed as I need it. I'm glad that he called now, because I'm just about to start planting corn, and it looks like I'm going to plant a lot of corn. I have been working towards growing and manufacturing my own feed - vertical integration - for years now, and I guess it's time that I started planting farm-scale crops. farm-scale: Enough grain crops so that I have sufficient supply for 1 year or more of operation of my farm. I'll do corn first, and then figure out minerals and protein later. I can actually get concentrate that is designed to be added to corn to make a complete ration for pigs, and I guess I'm going there sooner than I thought. New pigs for a new farm. This location is central to several fields, so it'll be the pigs home base. I'll run fencing from here to various areas that they'll graze on. The pen is pretty simple; hog panels connected with torsion screws that I made from pieces of high-tensile wire. I re-use these panels for years, so having a simple solution for connecting them that doesnt damage the panel is good. This fence isn't particulary sturdy - the little pigs won't push on it much as long as everything they need is inside the pen. Full feeders, automatic waterer, and plenty of buddies makes for content weaners. 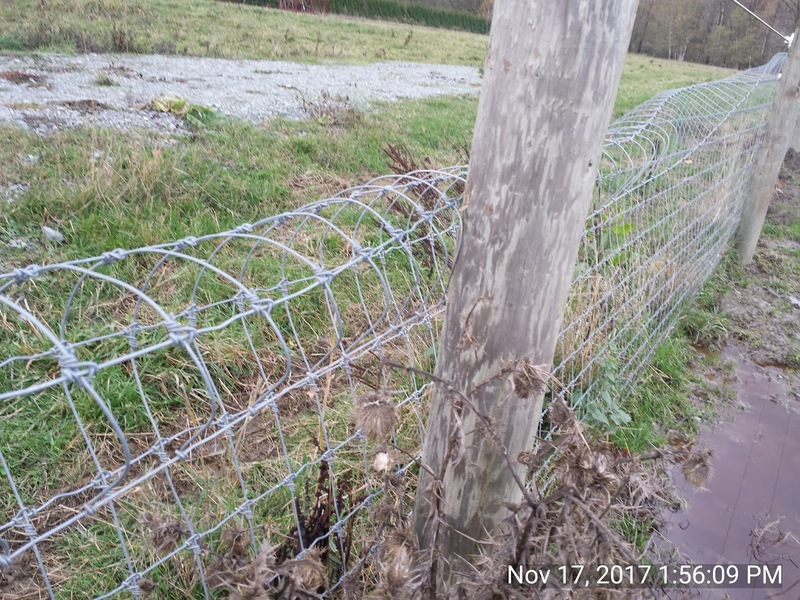 Later I'll run my electric fence inside this physical barrier to teach the pigs to avoid it, and then they'll be ready to start rotationally grazing. The weather is just starting to warm up, the grass is growing, but we haven't hit the spring growth spurt yet. One of the things that I get questions on from customers is what I feed my pigs. A mixture of complete feed, produce from super markets, bread and other human food that is past its prime or there's been some sort of accident that makes it available to me. (Accidents like spearing the side of a container of pumpkin pie filling with a forklift. The pie filling is just pureed pumpkin, but they can't use it in the food production because it's punctured - but the pigs like it just fine. There's a segment of the customers who are puzzled by that - why don't I raise my pigs on grass alone, like the guy in vermont? Or on acorns like the farmers in spain? It's happened often enough that I have a standard talk - "well, that guy in vermont who claims to raise pigs on pasture alone, I offered him $10,000 to raise pigs per his claimed standards, and he declined. " There's no question that you could raise pigs on forage alone; wild pigs manage to do that every year, and in warmer areas of the country they've been so successful that they have become pests and are basically hunted without restriction. If that's true, why not raise my pigs on forage alone? 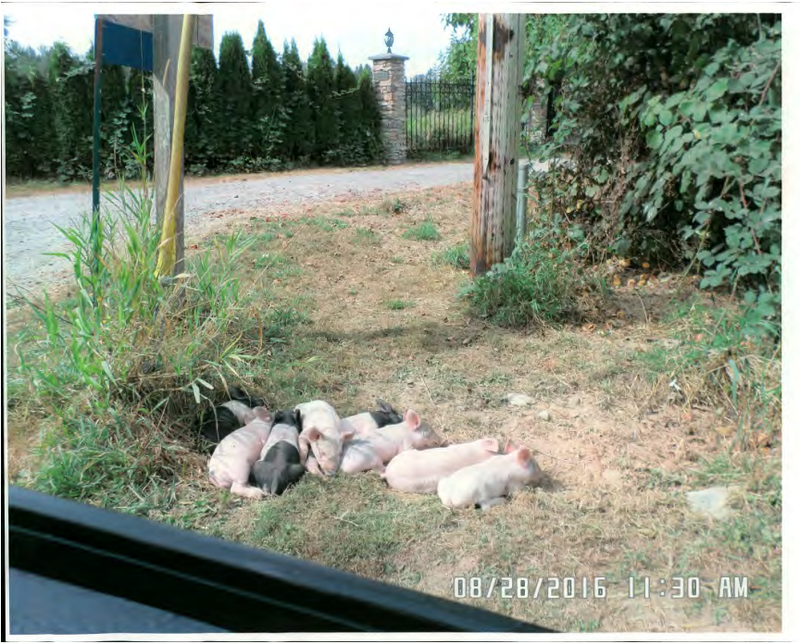 The claim made was that you could keep 20 pigs on an acre of ground and have those 20 pigs grow from weaned pig size to market weight on the forage they got from that amount of ground alone. So lets put some numbers on that: to grow from 40lb feeder pig size to finished pig size at 250lbs is 210lbs of weight gain. In a heated barn with very good nutrition and no immune challenges like the common cold - that amount of weight gain would take 520lbs of feed (2.5 lbs of feed per pound of gain). There's a lot of research on what to feed pigs and their nutritional needs vary by the growth stage they are in, but in a general sense we can get close enough for discussion by using the calorie value of a pound of corn (1660) and a pound of soybeans (2030). 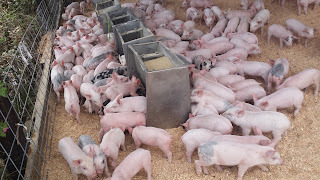 Pig feed is about 70% corn and 30% soybeans, so (.7 * 1660 + .3 * 2030 = ) 1771 calories per pound of feed. To raise one pig from 40lbs to 250lbs takes a little under a million calories in perfect conditions - remember, these pigs are in temperature controlled barns and are protected from disease or anything else that would impede their growth. That's different than the environment when they are raised outdoors. My experience with pigs raised on pasture is that they consume more feed; in the early parts of the year they're using the calories to keep themselves warm, in the later parts to keep themselves cool, and all of the time to fight off all of the small ailments that they're exposed to in nature. Every time they get a sniffle it doesn't hurt them, but it does hurt the efficiency of gain. 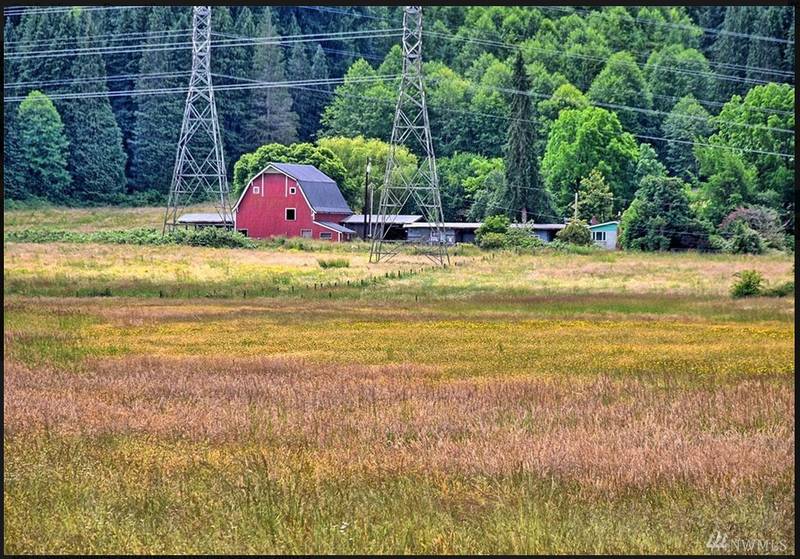 So for this hypothetical pasture I'd need to grow roughly 20 million calories worth of food at a minimum, with the real number probably being closer to 30, in order to meet the nutritional needs of the pigs. is: the claim is you can keep 20 pigs an acre and have them get all of the food they need from that acre while they live here. 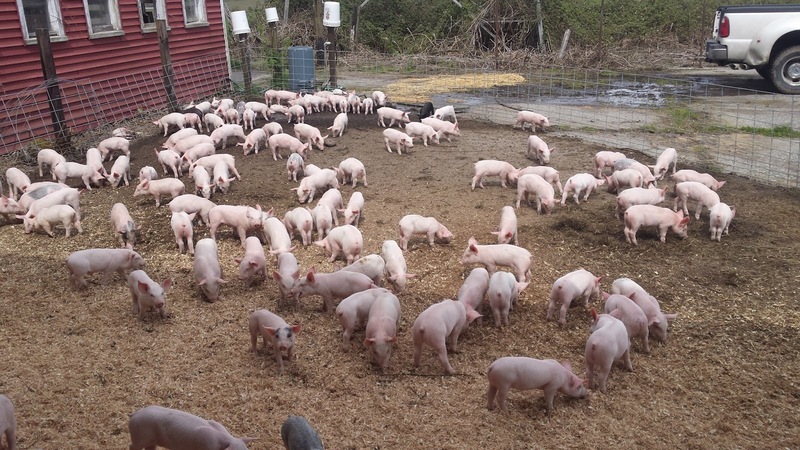 Even if you reduced the number of pigs by half - 10 pigs per acre - you'd still need to have the entire acre covered with either corn or potatoes that grew unmolested and were harvested when maximum calories were available. That's why I don't believe the claims of having raised pigs on forage alone. Not in the area described, and not at the speed claimed ("10% to 20% slower than on regular feed"). 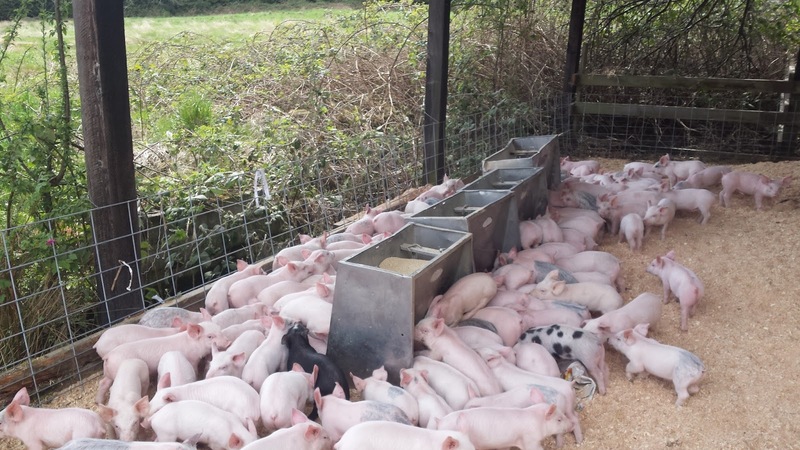 Now it's entirely possible to raise enough crops to feed pigs on your own. I'm doing that on my farm now - I plant separate acreage with corn and harvest that corn to form the bulk of my pig feed. My pigs are kept outdoors, on vegetation - mostly alfalfa, which they enjoy eating - and they're given a ration of last-years corn to grow on. In the winter the pigs allowed out,but choose to spend most of their time in the barn, sheltered from the weather. What would it take to grow a pig on pasture forage alone? After the flurry of events beween Nov 13th and Nov 22nd things are quiet. Dale ignores me, I ignore her. The trial is set for March 21st 2018 and I wait. On one hand I'd like to get this over - either way, guilty or not guilty - at least there would be some certainty. On March 21st I showed up at the courthouse at the scheduled time - 830 am, and the prosecutor and my attorney spent the next 3 hours arguing about everything; my attorney won some points, the prosecutor won some, from my lay point of view it was interesting. more so because if I lost this case I could be going to jail, or be fined a large amount, or both. They argue what can be admitted, and what can't. there's a huge controversy about pictures with writing on them - they get tossed out. Jury selection was voie dire; basically a set of open ended questions asked of potential jurors. I'm scrutizing the faces and trying to figure out who will be sympathetic, or at least fair, to my arguments. One juror says "He's got four counts against him? why are we wasting our time! this should have been solved outside of court with a fine". Another says "He should keep his animals on his property and if it happens twice it's his fault!" "I keep cattle and if he's got them running loose constantly its on him!" the property he now owns. i own the road. i own the land. he has no right to use the road. i have a permit that allows that. i've tried to get him arrested on trespass. this has been going on for years"
during this there's a whole bunch of objections by my attorney and by the prosecutor. the poor jury is standing up and going into the jury room every 10 minutes so the issues can be hashed out without them hearing what they are. my attorney is objecting to ms. shelton saying they're my pigs; she doesn't know that as a fact, etc. I watch the jury and hope that we're not losing them in this. I can't really watch their faces because i have to turn and look at them to do so and I don't want to seem like i'm staring at them. I want to stare at them. i want to read their minds. office davis from animal control gets up and says "yes, i've inspected bruces fences and he's spent thousands of dollars on them". The court adjourns for the evening and I go home to a sleepless night. The next morning we bring officer davis back to the stand, ask a couple of questions about his involvement in the case "i didn't take any of the pictures, I didn't see any of the animals, I didn't look at most of mr. kings fence" and the prosecutor rests. I offer a witness who talks about the fence, and then i'm on the stand. I answer my attorneys questions carefully; my attorney is terrified that I'm going to do something that will convict me, and i'm too. I answer clearly, with YES or NO as much as possible. i draw a picture of my fencing. 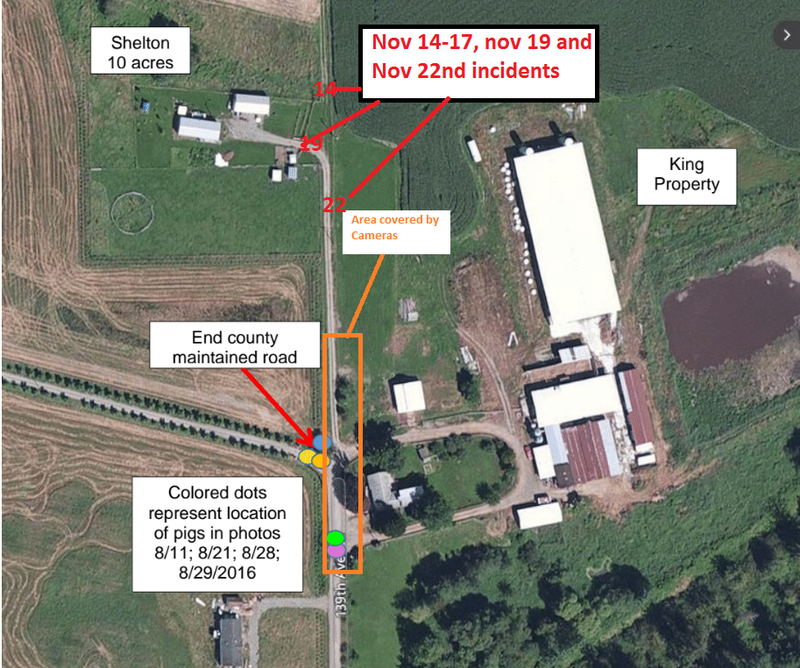 I talk about the activity on the farm that month - deliveries, employees, contractors, customers, everyone opening and closing gates. I talk about the 6 week delay in my learning about the incidents and how that makes it impossible for me to fix any problem. i say she could come and knock on my door, honk her horn or call me but she doesn't do any of that. she wants me to pay a fine, she wants to hurt me. even proven they're his pigs. She let those pigs out, she's causing these problems, she'll do anything to get Mr. King even turning herself in for violations she committed in an effort to harm my client! It's a little surreal to hear your own case being argued. this was a first for me. We are all done with testimony by noon. The judge declares lunch, and tells the jury to begin their deliberation at 1:15. The jury files out, and I'm told to stay within 15 minutes of the court for the rest of the day. I go home, and sit and stare at my tv but i'm not registering. I have no idea how the jury is going to rule. 1:30pm i get a call from my attorney. They have a verdict. I'm crushed. They barely had enough time to work through the jury instructions. Hung juries take a long time to happen. I know its not a hung jury. I drive to the courthouse picturing myself wearing an orange jumpsuit and picking up litter along the freeway. I wonder what the fine will be. I'm wondering if they convicted me of one count and let me off on the others, or if I got all counts. I grit my teeth and walk through the courthouse security, and I rise from the defendants seat and watch the jury as they enter. The jury won't meet my eyes. I'm cooked. Not guilty on all counts. I can finally talk about this part 5: What are you doing with that bale of hay? 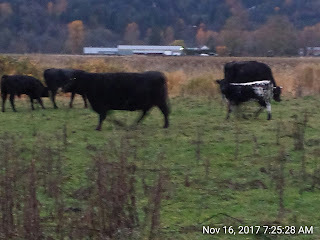 A couple of days after Dales son got her cows off of my property she took this photo and sent it into animal control with a witness statement as part of a complaint. 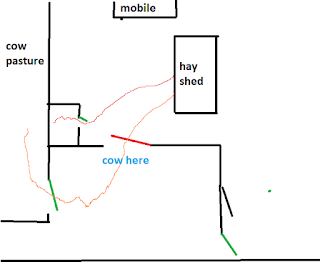 It shows a cow outside her fence and gate, eating some hay from a bale that is on a red handtruck. as per usual I didn't find out about this complaint until weeks after the fact. The picture was taken after dark, in a wind and hailstorm. You farmers out there: Do you wait until after dark in the hail to do your chores? She's retired. No job. Was home all day as near as I can tell. Dale claims that she was out feeding her cows and this cow happened to be there at the same time, and that the bale of hay that the cow is eating she was going to feed to her cows. 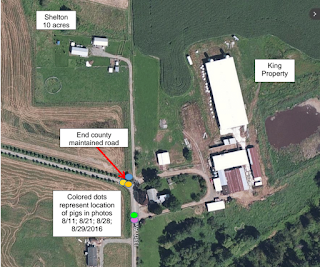 this is a diagram of the area - the blue "cow here" is where the cow is pictured. 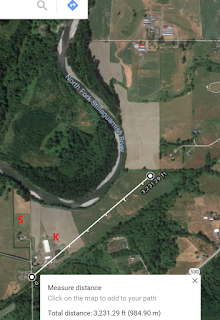 the red line is the shortest distance between her hay storage and where the cows are fed. The orange line is where she claims to have been feeding the cows. I don't know of any farmer who waits until the hail and wind to feed their animals after dark. I also don't know of any farmer who would choose to go through two locked gates (red and green in the diagram) every day to feed the cows. I do know that you can lead a cow around with a bale of hay, particularly if that hay is something that cows really like, like alfalfa. 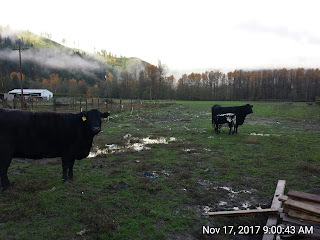 I watch as dale brings down the same handtruck as in the 19th photo, opens my fence, herds her two cows out, and down the driveway, and closes up my fence. 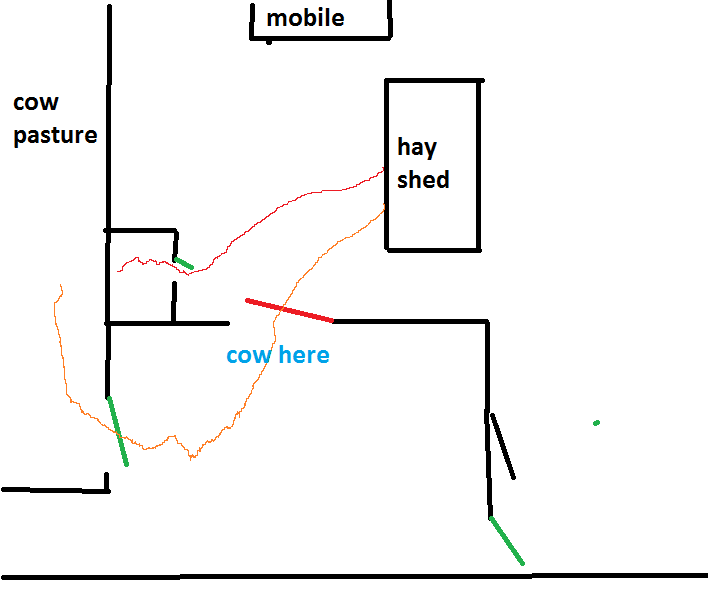 You want to know how I think that cow got in front of her gate? Dale just demonstrated it for me, on video. I ask her here what she wants out of all of this. She can't answer. I don't think she knows. She notes that there's alfalfa from the area of my fence she opens to her gate. I'm sure there is. I couldn't tell you when it was put there, but in my opinion it was put there by her on the evening of the 19th when she was luring my cow through the fence she opened. Shelton cows out 2nd time, opens fence and herds them through from bruce king on Vimeo. So at this point in this saga it's roughly November 15th. closest to her property and she retrieves them. She makes claims in the video that somehow my bull did this. She'll later claim that I hired someone to do this, or that I "suggested" that someone do this. that changes later to a story about how I took her gates apart at the hinge side and opened them that way - and she knows this because one of the bolts on the gate was shinier than the others. I've got the regulatory folks under control - there are only so many agencies, and eventually everyone who's involved gets a feel for the nature of the complaints that Ms. Shelton is making, and they settle into a routine, too. While they are interested in complaints and follow up on them, all of these agencies have bigger fish to fry than me and nothing seems to be wrong when they check it out. 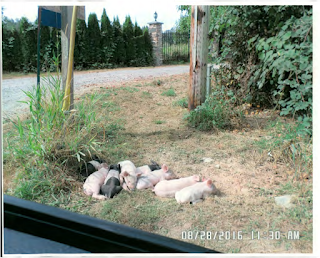 The criminal charges are pending - 4 counts of animals at large - and we've got a trial date of March 21st for a jury trial. 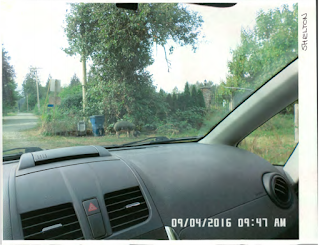 I'm concerned about going to court - I still don't have any good explanation for why the animals are out. They've got pictures of pigs on the road. It would seem that they have me dead to rights - it's hard to argue with the pictures. The new camera system installation has completely shut down the animal complaints. Which is good, but suspicious as well. It points out that I've got a human problem, not an animal problem. out of the right of way. It's a bit of work, but I'd rather have the fence in the right place than have to move it again later. So I tear down the 800' of fence, move it back 20', and put it back up. While the fence is down I replace it with a temporary fence that you'll see in the video below. On November 14th I'm counting my cows in my pasture and I come up with an extra cow. On the 15th I count them more carefully and come up with 3 extra cows. I take a picture of those cows the next morning. These cows are about a half mile northeast of my farm buildings in a fallow area of pasture. You can see the barns of my upstream neighbor in the distance to the north. The cows are where it says "3323 feet" in the picture below - I'm standing little south of the cows when I took that picture. Black cows are common in this area; so I call the four neighbors with cows closest to where they were and over the next 24 hours they all come back and say it's not their cows. later that day, the 16th, the cows are at the other end of my property, next to the fence between dale and I.
they've been in the grapes. On the 17th the darn cows are back in my grapes again. I still don't know who owns these cows and they've been all over my property for days. Usually cow owners notice their animals gone, but so far no one has claimed them. So I'm out looking at these cows and Ms. Shelton comes to the fence and starts yelling at me. "what happened! what happened!!". I walk away and think about this. This is a really touchy area. She is the sole witness in a criminal trial and has a history of filing restraining orders against me and making wild accusations against me. I asked my attorney what he suggested if I were to encounter Ms. Shelton and he said "video the entire incident, start to finish. You don't want to be in a he-said-she-said situation with her. Be obvious about your recording - don't hide it. " So following my attorneys advice I made the video at the bottom of this entry. 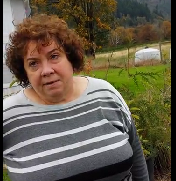 Let me summarize the video (below at bottom of this entry): I walk up to dale and ask her if those are her cows. She doesn't respond. I tell her that if they are her cows that she should get them back. She doesn't respond. She has a theory on how her cows got on my property - my bull has somehow caused it - and points to an area of the fence that is damaged as "proof" of this. I ask her to get her animals back and walk away. The top of the woven wire fence is bent over towards my property. I would associate that pattern to something coming across the fence towards me. If an animal had gone the other way it would have bent in the direction of that travel, away from my property. From this I would guess that her cattle crossed the fence here onto my property. The Sheriff did respond and I think I talked to the deputy about this. He laughed and said "don't worry about it", and that was the last I heard of it before I got the public disclosure a few weeks later that showed that Ms. Shelton attempted to get me charged with livestock theft. No charges were filed and I was not contacted by anyone about investigating this incident. I have the impression the sheriff thought her cows had gotten out and that was that. Note: this animal stuff happens out of the range of my cameras. Whatever is going on here I don't have security camera footage of it, and the other stuff that happens also will occur outside the range of the security cameras. 037 from bruce king on Vimeo. At this point I've had a whole series of animal control tickets and regulatory agency visits; racked up about $1,000 in fines (and paid them) and I've been scratching my head for most of a year trying to figure out what's going on. The regulatory folks are pretty easy to deal with: none of them ended up doing anything other than constantly inspecting my property - honestly, I got used to having random groups of people show up at my door demanding to see this or that. It had became routine after 4 years of this. Even the regulator agencies were getting bored. "Hi Bruce - planting again? " "Yep, mostly alfalfa and some orchard grass" "OK, just making sure. Have a nice day!" "You too, Bob!". 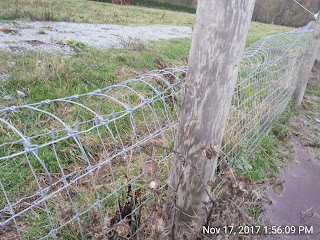 I've been all over my fences and gates and I'm starting to get skeptical that it's a fencing problem; it's pretty clear that I need more information but it's not obvious what that is, or how I'll get it. I interviewed 3 criminal defense attorneys, and picked one that I think is good; he's a judge pro-tem (sits in for judges when they need trial coverage) is the named partner at his firm, and has excellent reviews on avvo - but honestly, picking an attorney is a roll of the dice in itself. I'm not going with the public defender here; the stakes are pretty high, and I've never regretted hiring a good lawyer. So I consult with my attorney, and we start working the case, and the prosecutor sends over a plea bargain; if I plead guilty they'll only recommend I do a week or so in jail, pay a thousand dollar fine, and probation for 2 years - and if I break that probation by having an animal out, why, i go to jail for a year. I can make any commitment in that area, and so we push the trial date back and hire an investigator to start interviewing the only witness in the case - Dale Shelton - and the defense attorney is handling it. A month later I get a call from my attorney: The prosecutor is making a motion regarding the conditions of my release - apparently they've received MORE complaints about animals out, and the prosecutor is asking the court to set a $50,000 bail and to throw me in jail if I can't make it. In the court hearing the judge hearing the matter states "if the problem is that he can't keep animals on his property how is throwing him in jail supposed to make it more likely animals will be kept on his property? ", and I thought that was a good point. The prosecutor isn't having any of that, presses hard, and eventually the judge issues a warning that I should abide by the laws regarding herding animals on the road, and dismisses it. No bail is set. But I still have the basic problem with the animals, and I still can't figure it out. Finally in August of 2017 I go to costco and buy a home security system for $299 - it comes with 4 cameras and records the video for a month or so, so it's easy to go back to review what goes on. I buy another 4 cameras (total of 8) and mount them on my house so that I can see the whole area where everything is going on. If animals are going to get out I'll be able to see how, and why, and that may solve this mystery. The day I put the cameras in things seem to quiet down. Ms. Shelton drives by quickly; she doesn't loiter at her mailbox; she's not patrolling the edge of my property in her car anymore. I didn't hide the cameras; I wanted them to act as a deterrent as much as to show me what was going on. A pig doesn't care if there's a camera. A person does. And BAM! Just like that all of the animal stuff stops. No more complaints. why I didn't think of this before. Pretty happy with my purchase. On November 10th I'm idly googling my own name and I run across a legal notice in the paper - with my name on it. What? I note the court, the date and time and case number, and the next morning I go to the court to find that Dale has filed her 2nd anti-harrassment order against me. The hearing is in 5 days. Another round of discussions with my attorney, and we appear in court for the hearing. Judge hears the case, Dale testifies for an hour or so, and the judge dismisses her motion for the order. The judge states from the bench: "Ms. Shelton was confused when she filed this order"
Dale was trying to get me to take my cameras down via this order. 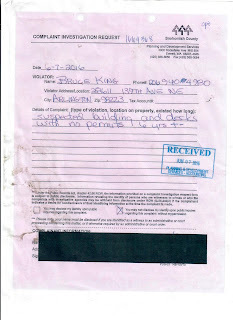 She complained that I was using the cameras to surveil her, and asked the court to order me to take them down. The cameras were mounted to my house and fence, and showed only my fences and gates. You can't even see dales house from mine. Why does Dale care so much about my cameras? If there are violations of law,the cameras will show it all. 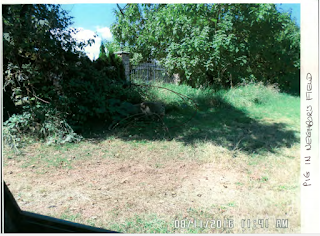 She has taken hundreds of photos of my house, myself, my livestock and my property - but apparently she is the only one who is allowed to do so. It's very odd. Suspicious. Next: Why are you there, Ms. Shelton? And what are you doing with that hay? And yes, there will be pictures and video in the next entry. 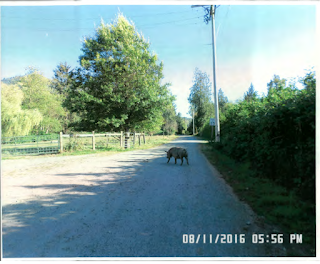 One of the biggest problems that I had with my neighbor was the constant complaints to animal control about my animals being out on the county road, and a couple of blog readers have asked 1) if there were animals on the road, and 2) how they got on the road. I'm going to talk about that in this post. Everything happened within a few feet of my gates - sometimes 5 feet, sometimes 20 feet. At no point were any of the animals more than 30 feet from my property in any of the photos. All of the photos were taken by Dale Shelton - she testified that in court. She testified that the time and date stamps were correct. 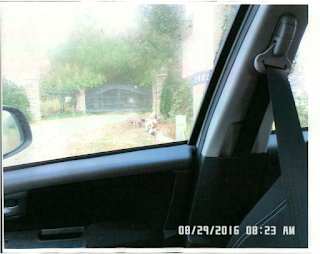 Most of the pictures show her sitting in her car when the picture is taken. None of the pictures show my gates or my fence. 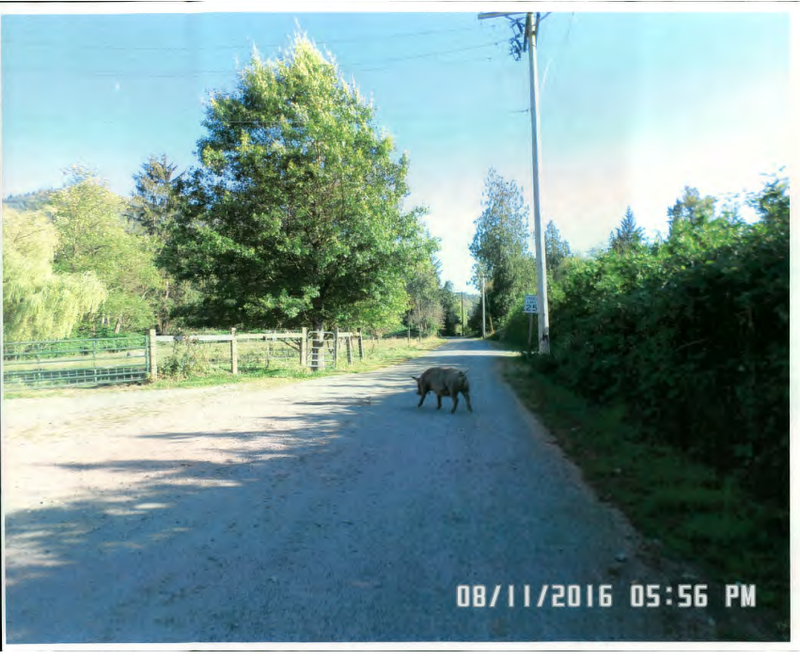 Pictures are hard to argue with - clearly there are pigs in the road. But there's some funny business about this pictures, and with my neighbor. 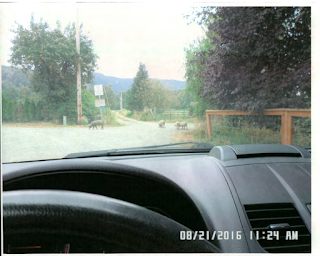 Think about this: If she's concerned about pigs in the road, she could just call me, or get out of her car and walk 20 feet to my front door, and reasonably expect that I would take care of the situation right there. With the pigs out, I could then immediately have the best chance of figuring out how they got out - pigs like to go back into the same area they came out of, so if you want to know how a pig got somewhere just chase it a little and it'll show you. But Ms. Shelton wouldn't notify me, or call animal control. She'd take these photos and then keep them for a few weeks or a month; she testified to this. After waiting a few weeks she'd send them to animal control, who would wait a few more weeks, and then issue me a notice of violation. What this meant is that I didn't get any indication that the animals were out until 4 to 8 weeks after the fact, and that "notice" would come with a $200 fine, which Ms. Shelton was probably overjoyed about. I would then be in the position of trying to figure out what happened a month or two ago - did someone leave the gate open? Is there a hole in the fence? Are these even my pigs - could they be the neighbors? I'd like you to think about what you ate for lunch 6 weeks ago. It was like that for me trying to figure out why these animals were out. What was I doing on august 11th I'd think - on october 15! Meanwhile the fines kept piling up. All in all Ms. Shelton cost me over $1000 in fines to animal control. I've had a huge distraction in my farming provided to me by a neighbor of mine. If you'd like to get a feel for what the history is, you can check out what I wrote about her in 2013. Yes, 2013. She's been on her rampage for 5 years. In those five years she's called every regulatory agency she can think of to complain about where I keep my pigs on my property, what I feed my pigs, where I feed my pigs, whether there is manure or contaminated water coming from my property. She complained when I was plowing my field and planting grass (he is filling and grading without a permit!) and so on. In those five years she's reached the Washington State Department of Ecology, The Washington State Veterinarian, The Snohomish County health Department, the Snohomish County Planning and Development Services (building permits), Snohomish County Sheriff and Snohomish County Animal control. She has registered one or many complaints (With animal services she's made at least 100 calls and registered something like 20 formal complaints) and each one has responded by contacting me in writing, sending staff members to my farm to inspect, or having that agency in turn contact other agencies, who then contact me or send staff members. I wrote up one of those early visits in 2013, by the Department of Ecology but that wasn't the last visit by that department, and that wasn't the only department that did visit. I've gotten to know every possible regulatory agency and staff member in my area on a first name basis. I started getting complaints about my livestock on the road, and for the longest time I couldn't figure out how they were getting out. It would work like this: I'd get a notice, with some pictures of a pig or cow out of my fence, on say July 1st. But the notice I got wouldn't be until the end of July, or into August - weeks after the fact. And the notice would come with a fine - initially $50, but eventually getting to $200 a shot. This gets expensive quick. I would appeal the fines, and try to figure out what was going on; maybe we were moving animals, or maybe someone else opened a gate, or maybe they're not my animals, but the appeal process for this violations is a bit of a kangaroo court in my opinion. The hearings examiner who hears them has never upheld any appeal of animals at loose at any time on any basis for his entire tenure in my opinion and based on the research that I was able to do, and as a result I'd just pay the fine after losing my civil appeal and move on. But the complaints kept coming, and pretty soon animal control decided that they would charge me criminally for the animals out. Every time I'd get a notice that I had an animal out 4 to 6 weeks before I'd go out, and look carefully at the fences and gates, and if I saw anything amiss I'd do something. Add more fencing. A hog panel. More posts. Clear the brush. Make sure the fence was carrying a good charge, whatever I could do. But the complaints, and pictures, and fines, continued. At some point I received a criminal summons from the Snohomish County Prosecutor that they were going to charge me with 11 counts of criminal animals at large,and that each count carried a penalty of up to 90 days in jail and a $1000 fine; potentially I would have to serve nearly 4 years in jail and pay $11,000 in fines if I were given the maximum sentence as charged. 4 years in jail. that's serious jail time. Ms. Shelton wasn't satisfied with that though. While complaining to all of these agencies about me she filed an anti-harrassment order against me, claiming that I was harassing HER. She did this first in 2014, and then a second time in November of 2017. If she was granted either of those orders all she had to do to have me arrested is claim that I frowned at her, basically. And she's my next-door neighbor. That would be unbearable. So now I'm dealing with a restraining order, a multi-count criminal prosecution and random complaints to agencies, along with a building permit... oh. I didn't talk about the building permit yet. Dale and her husband used to own this property, and during the time they owned it they built two barns. 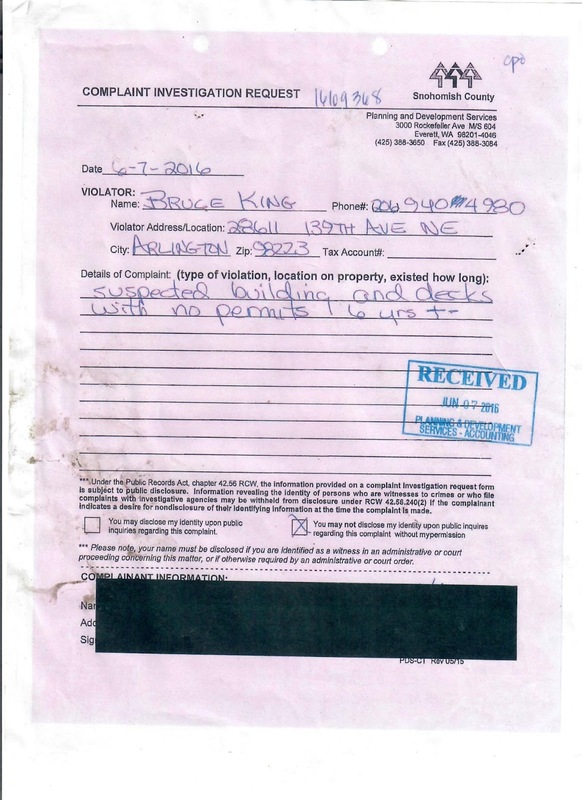 They apparently didn't get any permits for those barns, and they didn't disclose that to me when I purchased the property. One small barn, and then other is the biggest, most expensive barn on the property. Dale admitted in court that she made this anonymous complaint (that's her handwriting) and that she did so to harm me. Dale is a retired permit/construction inspector for the department of transportation. If anyone knows when a permit is needed, she's the one. 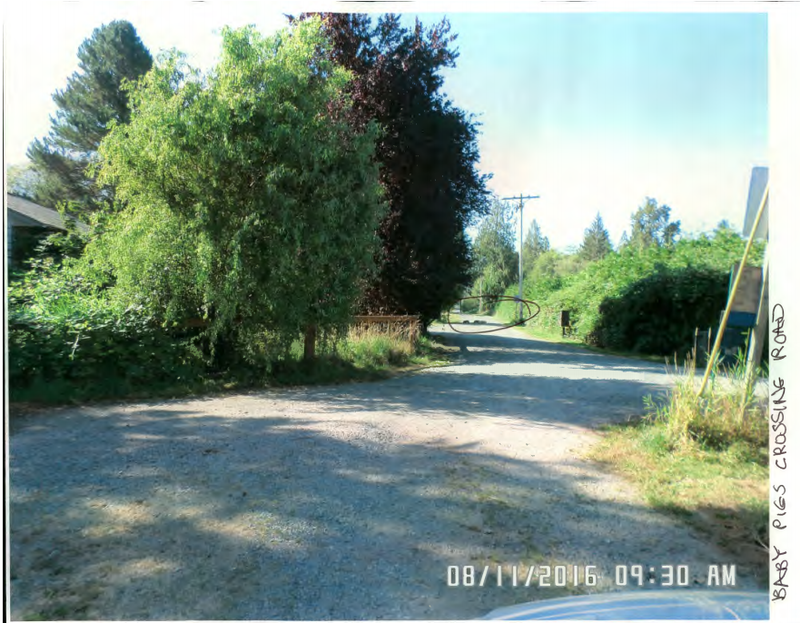 Snohomish county Planning and Development services investigated, and found that yes, buildings were present on my property that were constructed without permits. in 2006. I purchased the property in 2013. Dale turned herself in for a violation that she committed to harm me - I have to say, that shows dedication. She's putting herself at financial risk by doing so,but apparently no cost is too high if she can cause me pain. So in addition to all of the other stuff she's putting me through she tosses building permits onto the fire, and then fans it by making followup calls to every agency on a regular basis. Criminal charges. Potentially 4 years in Jail. More than 10 thousand dollars in Criminal fines possible. Building permits that cost tens of thousands of dollars to complete. Civil fines. Regulatory action. That's on top of having to run a business, and all of the normal challenges of farming. If you've considered keeping bees, now is the time to make that happen. The package bee season is in about two weeks, and the cost this year for 3lbs of bees plus a queen is $140 , +-$10. nice to see the bees flying on a warm day! You'll find bee packages advertised in your local craigslist, in the farm and garden section. You'll need a hive to put them in, and you can find "beginner beekeeper" packages on the web. My hives did pretty well this year, compared to previous years. I had 6 hives going into the winter, with 3 surviving now, for a 50% dieoff. The hives that died show different patterns. One hive, full of honey and pollen, is pretty much empty of bees. Another hive shows what I call a starvation pattern; there is still some honey in the hive, but the bees clustered in the center away from it, and died in a group. The third hive that died has some bees, more than the empty hive, but not as many dead bees as the starve off hive. Because the hives that died off may have something that is contagious to bees I'll discard the combs and bake the woodware in my oven to sterilize it - the bottom board and the supers themselves. The hives survived will get new combs to grow into; I'll leave the existing combs there. to make pay to keep farming their land after all the profit was gone, between 2006 and 2009.
Who is taking the farmers money? Agribusiness. Those folks who sell you the improved seed and the better-weed-spray and the computerized tractor and all of the other stuff that makes farming easier have figured out how to basically take every cent from the farmers for the last 32 years. What do the farmers live on? Primarly the subsidy offered by the Canadian government. Without that subsidy these farmers would have been out of business long ago. I'm all for progress, and I'm all for efficiency, but I can't pay more than all of my income and still be a farmer. Could you? Looking through the seed catalogs now, thinking about what I'm going to plant. This is an aerial view of the new farm. 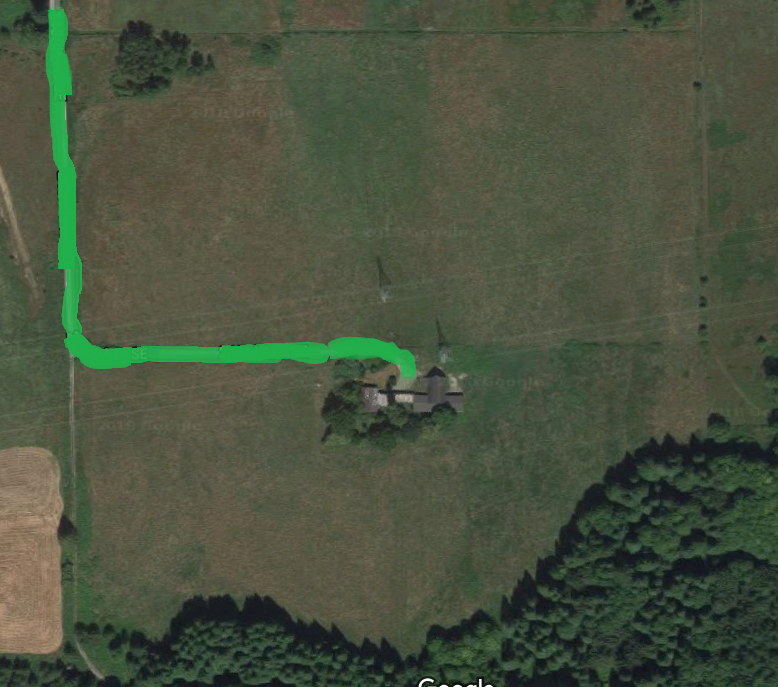 It's 40 acres in a square, and the house and barns are directly in the center, which is actually where I'd put my house if I were to build a new one. This is an older farm; the barn was built to be hand-worked and shoveled; I'm going to guess 1905 or 1907 based on some deed information, but certainly no later than about 1920. The house is newer; the previous owners family told me that it was run as a dairy and the house burned down one year, so the farmer rebuilt the house with masonry blocks because of the three little pigs :), so a masonry block house it is. The picture is oriented so that north is up. Along the south edge is a pretty thick stand of young cedar trees; they're not mature enough to be timber,but they'll be there in 20 years or so. Where the trees are is a steep hill that rises to the south. At some point in the past they installed at least two generations of drain tiles; once with clay and cement pipes, and once with plastic corrugated pipe. Even with that there's still a fair bit of water that flows off the hillside, down past the house and continues to the north property line. The ground hasn't been worked in a while, and it's pretty rough and rippled; which isn't a problem if you're grazing cattle, but slows you down when you're harvesting hay or any other crop. I suspect that the ground fertility and PH isn't where it should be and that I'll have to do something before the final crop is planted. In this area that usually means a healthy dose of lime (3-6 tons per acre) and then trace minerals (copper, sulfur, selnium, that sort of thing), and then whatever is called for in terms of fertilizers. I'm going to hold off on making crop choices until I get the soil back, but whatever I do end up with has got to take into account wet feet, at least during the winter; and that limits the choices I can make. Speaking of rough; someone at some point took a trackhoe and dug holes in random places around the pasture. maybe 20 or 30. They're 4' wide and about 6' deep. I guess that was to keep you awake as you drive around on the tractor! At this point I'm inclined to plow and final-grade the land to get it reasonably flat, and look at the drain tiles to see what shape they're in, how much water they're carrying now, and figure out if I want to do something about them - flush them out, replace them, ignore them. Not sure at this point. In the northwest corner there's a small group of trees. 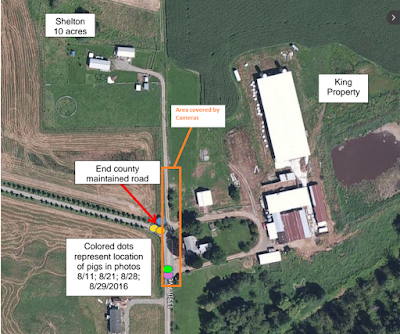 It looks like that may have been either a barn or a previous house or corral; there's lumber there and some old implements; next to it, to the east, is a small gravel borrow area. The gravel area fills with water at this time of year; its about a half-acre in size, and would actually make a nice farm pond if it could hold water. Maybe feed it new water from the drain tiles. Kinda fun to think about. 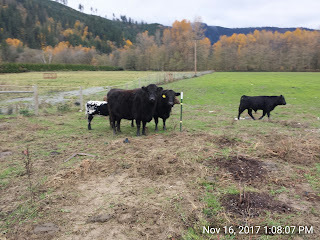 The plowing will have to wait until we've got some drier weather; in the meanttime I can repair the barbed-wire fences there, put in an electric, and graze the cattle on the new growth, particularly in the areas where I'll be working the soil. No reason not to get some forage off of it before I plow it. B) There may be someone to work with us, but I have no idea how to find those people because I don't actually know anyone in the area. It's pretty far away, so just dropping by to get to know people would be really hard but I might be able to make a weekend out of it. So, dear fellow farmers, what would you do if you needed to move to a different area where you didn't know anyone? I'll be looking for a new tenant for the farm pictured above this summer (current tenant moving to montana) so I asked what sort of farming that they wanted to do. Answer? Hey that pretty much fits our timeline! We're currently raising Icelandic Sheep, Kunekune pigs, various rare breed chickens. We're small right now because we're restricted but we want to grow as fast as possible, but really want to be 100% grass fed. As long as you have grass we'll be happy. 3br houses rent in this area for $1500-1800/month. utilities are another $150. The 40 acres is in grass right now, produces 500 round bales a year @600lbs each (2-3 cuttings, weather depending). the bales cost me $13 each to produce, sell for $35, so the land nets about $11k/year, or roughly $275 profit per acre per year. so if you wanted a couple of acres you'd have to pay at least that per acre to make it worth my while. I'm talking about this to you to give you an idea of what the math with be with any farmer landlord. 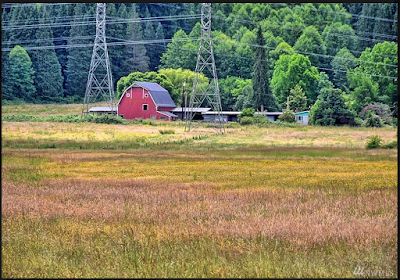 your enterprise would need to produce $1600+150 = 1750 per month to cover the rent, and if you wanted 3 acres, add another (275 * 3 / 12 = ) $70 a month for $1820/month. have you thought this through to the point where you have a plan to net (after taxes) $3k a month? Think I was too rough on them? I have a love-hate relationship with the cold. the love part is that it's absolutely beautiful; I live in the foothills of the cascades, and there's forested hills on every side. Snow on evergreens is really pretty; and the cold crisp air means that hard work is a little easier; and the mud turns into concrete, and walking and driving are a little easier. I hand-feed the nursing sows anyways; it's a formal time for me to take a look at the sow and her litter and the conditions - are they dry, do they have enough food, what's the body condition of everyone - so walking around with a hose during the rounds isn't too much trouble. The piglets are chilly this time of year; they spend a lot of their time pressed up against moms belly and jostling for position. When I come back in it's nice to eat something warm, and spicy, and good. 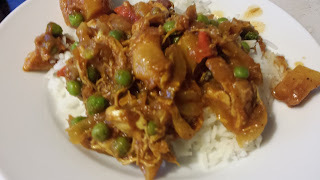 So tonight I made chicken curry. from the peppers if you don't like your curry hot. color of light brown sugar. Add the tomato sauce and refill the tomato can and add that, too. times. Patience will be rewarded. When the potatoes are cooked, add the garlic and ginger, and the peas. run the milk cow with, and it was always handy to have her around to lead the other cattle with. I'd walk out, put a halter on her, and then lead her wherever I wanted the herd and they'd all follow. I found a little heifer that I thought might work at the auction. She's 330lbs, about the same as the original milk cow and I just now got done getting her set up in the barn after transporting her from the auction; she looks to be 4 months old, which is the age that I wanted to start with. Part of the initial care for a new cow is to get it on a healthcare schedule that you know about; I don't know when she was last wormed, or if she was, and what if any vaccinations she's gotten, so I wormed her and gave her an 8 way vaccination and bangs vaccination. 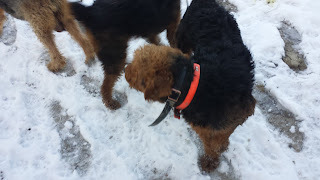 I use an old-school method of tracking animal vaccinations - i have a calendar on the wall that contains the vaccination status of my dogs and livestock, and I can look back at it to see where things are. I have to be careful to put it down as soon as I do it however; because if I can't remember it and it's not on the calendar I'll do it again, and while it probably won't hurt to get two doses, it's an unneeded expense. because started beef calves of the same weight sell for a lot more. a 330lb beef calf would have sold for about $400 - assuming $1.25/lb. Beef calves are pretty popular right now and will get more popular as we get into spring. I'll be buying more beef calves this year if I can find some that I like the look of and that aren't too expensive. If you'd like to see the process I went through with the last cow, you'll find the first entry here, and that entry contains a link to all of the blog posts I made about that cow.